For an equine athlete to remain healthy, the horse needs to have its body and mind strengthened and conditioned over a significant period of time. To perform to its highest level of potential, the horse needs to be encouraged into a ‘healthy frame’ or ‘position’ that allows it to develop the necessary muscles for balance and throughness. When these muscles have been developed through a careful and complete conditioning program, the equine athlete will be able to enjoy moving freely without injury for many years. For the horse’s mind to remain healthy and relaxed, the rider needs to approach each new level and exercise with calm and assertive leadership remembering to always bring the horse back to relaxation before moving along the training scale. When being ridden, the goal is for the horse to regain the body position and balance it has when it is without the rider, and to learn to move easily and without restraint under the rider’s weight. For the horse to be able to obtain this unrestrained way of moving, the horse needs to be in balance. When the horse is in balance, then he can relax and then be able to move without hindrance. So, where does one begin? Let’s start at the beginning with foundation groundwork. What is groundwork? Dictionary definitions of general groundwork include: essential or fundamental part; preliminary work as a foundation or basis; preparation made beforehand. Equine groundwork is defined as a series of structured exercises performed on the ground with a horse to establish a strong and wide foundation that is used to advance a horse’s education and ability. While keeping the handler in a safe environment, these exercises establish and maintain a healthy leading partnership between the horse and the handler. 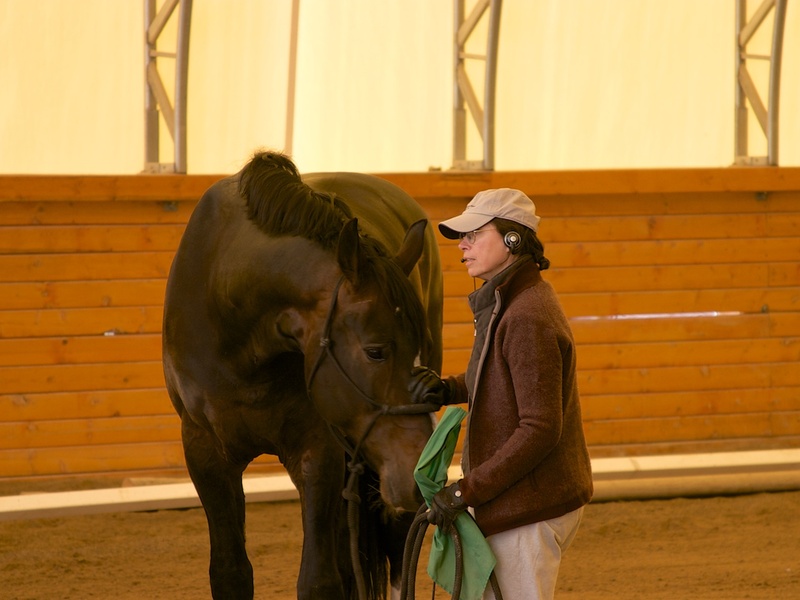 This training is an essential part of the horse’s conditioning and schooling program. Karen’s adapted slow, progressive stretching and bending exercises are designed to encourage mental relaxation and increased physical suppleness. Lateral exercises, such as leg yield, encourage the horse to stretch and bend on both sides of his body. This increase in flexibility and suppleness leads to straightness in the horse. Groundwork allows the handler to refine his/her skills and aids. It also allows the horse to find their own balance and throughness without the weight of the rider or the rider’s lack of balance. Groundwork exercises prepare the horse to perform movements in a healthy and efficient way. This work helps the horse carry the rider while moving unrestrained; therefore the horse stays sound over a long period of time. When the horse is physically and mentally comfortable during the exercises, a positive experience is created for the horse and rider, which leads the horse to welcome such work in the future. Following classical principles, along with an educated awareness of biomechanically-oriented movements, these exercises develop healthy muscling and increased flexibility. This type of groundwork encourages the horse to balance himself equally on both sides, move straight in both directions while on a line or curve, and carry himself with “lightness and self-carriage”. The exercises can be used to help school a green or young horse, warm-up a mount prior to riding, and confirm lateral movements on the ground before attempting them on horseback. Groundwork provides the rider a new perspective in seeing how their horse moves and feeling any tensions within the horse. This adds an important dimension to the rider’s understanding of the horse’s body and the suppling, strengthening, and conditioning the horse needs to perform well. The handler needs to understand that these exercises require time. The most important thing to do is to pet and encourage your horse. Purpose: Many people feel that rope halters provide clearer communication with your horse as compared to a leather or web halter. An effective warm up has the benefits of enhancing performance and reducing the risk of injury. A well-designed warm up involves the gradual increase in exercise intensity, which facilitates the body’s adjustment from rest to exercise. The first objectives are to establish physical and mental relaxation in the horse, so that the limb movements become free and elastic and the horse starts to move through their back. Relaxed and warm muscles are energetically efficient while tense and stiff muscles result in an overall increase in energy expenditure. Warm muscles contract more powerfully and warm fibers are more pliable. This reduces the risk of injury due to tearing of the muscle fibers. Cold muscles are not as flexible and elastic as warm muscles and are prone to such injuries as: muscle, ligament, and tendon strains; muscle spasms; stiff gaits; and maybe even torn muscles or tendons. Help keep your horse healthy, and avoid muscle strain and resulting performance issues by routinely practicing a sufficient warm up routine. The warm ups should be short so as not to promote fatigue. Why is it important to have your horse stretch? Stretching increases the flexibility and suppleness of the horse. Suppleness refers to the range of motion about a joint. Not all joints are equally supple and there is a range of motion that is specific for each joint. During stretching, exercises tissues are elongated resulting in less motion restriction around the joints. Horses naturally stretch and do so almost daily. This stretching helps to tone up the muscles that they use the most. Usually a horse does not over stretch. “Stretching improves the tone of the muscle fibers and the elasticity of the ligaments and the joint capsules. Stretching reduces muscles tension, and therefore muscle pulls. A strong pre-stressed muscle resists stress better than a strong un-stretched muscle.” Hourdebaigt, Jean-Pierre, LMT. Equine Massage: A Practical Guide. Hoboken, Wiley Publishing, Inc., 2007. When doing passive stretches, there is no muscle activity involved in generating the position. Benefits of passive suppling include: increase of the range of motion in the neck, shoulders, and hips, increase in relaxation, and a reduction in post-exercise stiffness. Carrot stretches and leg stretches are passive exercise examples. All riding involves movement within the horse. All disciplines require dynamic suppling and flexibility. Exercise examples of dynamic suppling include: turns, circles, and lateral movements. More intense examples include: walking and trotting over poles, riding up and down hills, jumping, and barrel racing. Can dynamic stretching cause injury? Dynamic stretches have the risk of injury due to the movement involved. It is important to understand what muscle groups are being utilized and the maximum range of movement that is healthy. When doing dynamic stretches it is important to have the horse move slowly, gently , and with relaxation. Muscle, tendon, and ligament fibers are torn when joints are overstretched. These tears can lead to soreness and lameness. Overstretching can be caused by stretching cold muscles, too intense of a stretch, too quick of a stretch, and too many repetitions. Signs of injury can include: local heat, sweating, and pain when moving or when palpating. When muscles, tendons, or ligaments are overstretched different stretch reflexes are activated. When a muscle or tendon is rapidly or strongly stretched, receptor organs within the muscles and tendons are activated and limit the amount of the stretch. These muscle or tendon receptors function to protect against injury due to excessive tension or stretching. Rapid muscle contraction (within healthy parameters) induces a powerful reflex contraction which is beneficial in strength training. But theses same reflexes can limit healthy stretching. For suppling, slow stretches minimize stretch reflexes. The muscle and tendons are then able to be held in a stretched position without an increase in muscle tension due to the receptors being activated. Muscle tension limits suppling benefits. To maximize suppling exercises and to limit stretch reflexes, it is important to have the horse mentally relaxed before starting the suppling exercises. Mental tension and stress creates tension in the body and limits muscle stretching. Relaxation helps the brain to relax the muscles so that stretching can occur without tension. Relaxation exercises include: slowly stroking the horses neck (about 3 inches per second) , head down, and passive lateral flexion of the poll ( the head needs to move only 2-3 inches). Hold each exercise for about 20 seconds; it takes about 20 seconds for a muscle relax. Relaxation responses include: licking, chewing, slow blinking eyes, and yawning. 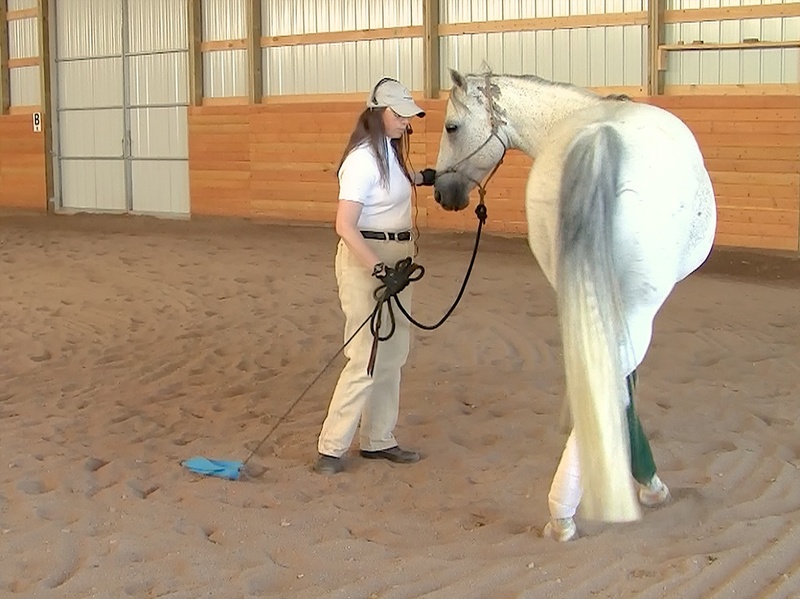 The goal of RPH stretching exercises is for the horse to relax and stretch throughout their body while maintaining a close partnership with the handler. RPH groundwork exercises include both passive and dynamic stretches. By omitting relaxation and stretching exercises, one may lose time instead of gaining it. The reason being is that a tense or un-supple horse will create considerable difficulties for the rider and will merely waste its own and the rider’s energy without bringing improvement into the quality of the daily routine work. After warming-up, the rider should devote at least 15 to 20 minutes to the exercises in order to enable the horse to get rid of any tension and stiffness. A relaxed and flexible horse is then mentally and physically ready to continue on with a conditioning workout or a schooling session. Cool down you horse by walking until the chest feels cool. If it is cool or cold outside, add a blanket during the cool-down. After the horse is cooled and untacked, it is a great time to do passive exercise and a massage-like brushing session. This helps to prevent soreness and stiffness in the muscles. Every horse has a stiff side and a more supple side. Horses are naturally “left” or “right-handed”. Most horses seem to be stiff going to the left and are usually heavier in the left rein/lead line; these horses travel with a hollow right side. A handler can see this from the ground because when the horse travels to the left on the lunge, their head faces to the outside and the barrel is counter-bent on the circle (barrel is curved inwards towards the handler). This stiff, counter-bent way of going is due to contracted muscles on the right side and overstretched muscles on the left side. When going to the left, the right side is stiff and the barrel cannot swing to the outside. When the barrel does not swing to the right, the left hind has a hard time coming through and the horse travels stiffly around the circle. If the horse is stiff going to the left, the horse will usually travel around the circle leaning in with more weight on the left shoulder. The head and neck counter-balance the shoulder, thus they are turned to the outside. For horse to be able to go evenly on both reins and equally pushing with both hind legs, the horse needs to develop straightness. Straightness can be defined as a horse whose forehand is in line with its hindquarters (its longitudinal axis is in line with the straight or curve track it is following). The horse’s shoulders are narrower than the hindquarters and when ridden on the rail this can encourage crookedness. This encourages the horse to travel with the inside hind to the inside of the inside fore. The result is that the inside hind has to push forward more while the outside hind is required to carry more weight and to bend more. The inside hind carries less weight and over time can become weaker. Straightness can be accomplished through lateral suppling exercises and the stretching exercises. “Balance in connection with a moving horse is understood to mean correct, uniform distribution of the weight of the horse and rider on its four legs.”, Steinbrecht, Gustav. The Gymnasium of the Horse. Cleveland Heights:Xenophon Press, 1995. When a horse is standing still, the front half of the horse is heavier than the rear half. This naturally puts more weight on the front legs. With the additional weight of the rider, the horse’s balance becomes even more on the forehand. Additional weight on the forehand hinders the horse’s ability for quick turns and limits the range of motion of the shoulders. Limited range of motion in the foreleg shortens the horses stride. The weight distribution should be that the horse balances the weight from front to back in a ratio in alignment to the natural carrying capacity of the four legs. The hindquarters are stronger in nature due to stronger bones, joints, and muscles and because their joints are like compression springs and are able to bend under heavy loads. The foreleg joints are not able to compress their angles and only serve as pillars to help carry the horse’s torso. Therefore under saddle, the hind legs should carry more weight than the front legs. (Steinbrecht, 1995). “The object of training will be to correct the balance by making the hindquarters carry a greater proportion of the weight and to relieve the forehand by transferring the weight from the shoulders to the quarters.” Podhajsky, Alois. The Complete Training of the Horse and Rider. Hollywood: Wilshire Book Company, 1967. Groundwork exercises that shift the horses weight from front to back, help the horse find a balance point that encourages the horse to carry more weight on the hind legs. Many horses struggle with balancing their weight evenly from side to side. This can be due to a straightness issue. (See Lateral Suppleness above.) Many horse tend to lean on corners and turns. This uneven weight distribution can cause lameness and a decrease in efficient movement. Groundwork exercises that require the horse to evenly weight their legs from side to side help the horse to find lateral balance. This lateral balance can easily be taken up into the saddle. Equine groundwork can be very fulfilling and extremely beneficial to your equine athlete. Yes, it does take time, but it is time well spent. With these exercises the handler can form a close, leading, partnership with their horse and their horse can find relaxation, balance, throughness, and suppleness. Both the rider and horse can refine their movements and aids in a safe, slow paced environment that results in better communication in the saddle. This groundwork builds a strong foundation that leads to better performance for both the horse and rider.